The multiplayer is sadly only Linux to Linux. It is not cross-platform with Windows. This is a bit of a sore spot, but thankfully the single-player seems to be great. Feral confirmed to me that they are aiming to get Linux vs Mac like Empire and Med II in time for the Mac launch. You can see the reasoning why in Ellie's previous post about CoH2 here on Steam, which gives some small insight. You can view our livestream schedule for other events here. Here’s a preview of a random battle I did, I realise how badly I was doing everything but in my defence this was one of my first battles. This is another of Feral Interactive's games to fully support Mesa, thanks to the hard work of the Mesa developers. All benchmarks done with the built-in benchmarking tool on my test/benchmark PC. 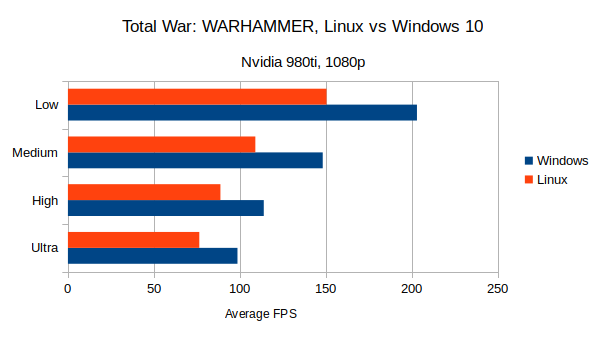 Due to the way the benchmark is done in TW, I will only be giving the average FPS. Specifications: Ubuntu 16.04 64bit, Intel i5 4670K, 16GB DDR3 RAM, Standard Hard Drive, 1920x1080 resolution. Using the Nvidia 367.70 driver. Note: All setting seem to leave Textures on Ultra (even when on Low). The only preset that uses Anti-aliasing is Ultra, which sets it to FXAA, all others have it turned off. 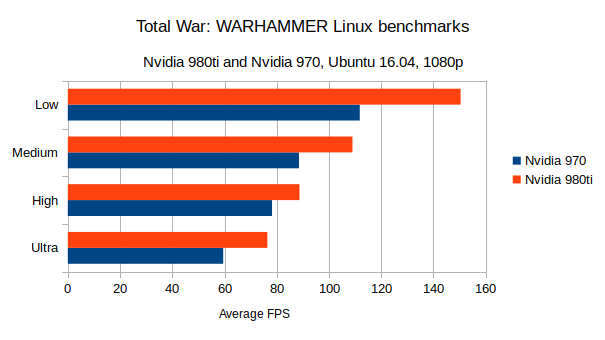 All benchmarks done using the presets as-is on Linux. I made sure the Windows comparisons had the exact same settings as Linux. Considering that an Nvidia 970 can get practically 60FPS on Ultra settings, I would say the port is pretty well optimised. 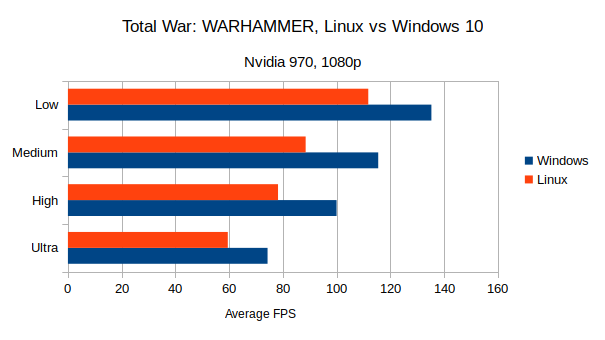 The Linux scores are between 73% and 82% of Windows FPS, so pretty standard stuff when it comes to performance loss on OpenGL Linux ports. I haven’t witnessed any large drops in performance during the campaign map or during larger battles, it’s been a real pleasure to play in terms of performance. The game seems to be extremely stable, in my many hours of testing I haven’t encountered a single crash. It’s pleasing to see that Feral have kept putting out games that, at least for me, are very stable. As expected from a Warhammer title, the intro video is very well done and is graphically quite impressive. Would have been nice to have the intro at 60FPS, as the video is locked to 30FPS which does make it seem a bit sluggish. Still, it certainly got me interested in it right away so it did the job. 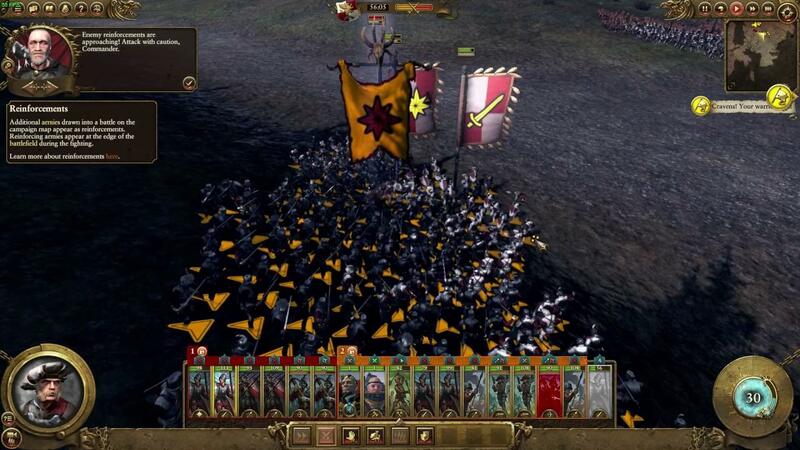 For those that don’t know, Total War: WARHAMMER is a mix of both a turn-based strategy and real-time strategy. The strategic board of the world is turn-based where you manage your empire, while the battles are intense real-time ordeals. While there is a simple in-game tutorial when you play as The Empire, you can also access an overview which brings up a Youtube instruction video. I recommend watching it if you’re not familiar with Total War at all or, if like me, it’s been a long time since you last played one. It was very useful just to get a quick idea of what to expect. Armies are each commanded by a Lord—who can level up, equip special items and banners, and gain skills. Each army can also have powerful hero units, which are interesting, as they can serve two functions: wander alone on the campaign map providing benefits to provinces they are in, or as a powerful unit within an army. Heroes also gain experience points from fighting and performing other actions, which can be used to upgrade them as well. These special units can be very useful in actual battles and they can sway the battle with their power. It’s all rather familiar to anyone who has played any Total War, Civilization or other grand strategy type games. You will be dealing with research and diplomacy, rebellions and so on..The variety in gameplay comes from all the differences between the in-game factions. For example, Dwarfs will need to keep an eye on their grudges and act accordingly. Whereas the Vampire Counts spread corruption and things like that. It makes each faction a unique experience to play as, which is spices things up across multiple playthroughs. What I really like about the game that helps me be genuinely interested in it is that it’s not bound by history. We have plenty of historical games, so it feels rather fresh. The variation in the different types of units is fantastic; seeing soldiers run at big lumbering monstrosities while massive artillery fire comes bearing down sure is a sight to see. The battles themselves are certainly brutally beautiful. What I like about the battle system is that you don’t actually have to command the battles yourself. You can have them auto-resolve and the AI will just do it and present the outcome to you. This is particularly useful if you have an army that will quite obviously stomp all over an enemy easily. It saves you time when you might not want to even bother going directly into the battle yourself. The battles are immensely fun, especially when you manage to hide entire legions of your troops inside a section of forest to flank your enemy. Using charging horses to break through enemy lines while archers and artillery strike, to thin them out, is glorious. There is a bit of a controversy surrounding the DLC in the game. I won’t go on about it too long, but I feel the need to point it out. Warhammer as a universe is pretty violent, and this game is largely about destructive battles. To see any blood or gore you need to buy a cheap DLC and enable it. I admit it’s a complex issue due to ratings boards and if it was included by default, or as a free DLC the game would likely have a much higher rating. I don’t agree with it personally, but it is what it is. It’s a really minor feature that doesn’t actually add anything substantial to the gameplay, but I needed to mention it for clarity. There’s also the fact that one extra playable race costs over a third of the price of the entire game, I’m certainly not a fan of the DLC model here. Feral Interactive don't control the DLC or pricing though of course, so it's down to the original developer and publisher. Still, even without the extra DLC on offer, there’s likely tens of hours you could put into it without needing any of it. The Total War games usually have a rather active modding community too, with Total War: WARHAMMER already having over 2,000 mods. The problem I find is still the same as it is with all Total War games: I am horrific as a tactician when it comes to actually participating in battles. Not even my newly-found enthusiasm for Warhammer helped me learn to not lose all my soldiers repeatedly. Even though I’m really not very good at it, I found it to be the most interesting Total War game I’ve ever played. Likely because it doesn’t have a huge amount of depth to it (so it’s easy to get to grips with) and because it’s rather good-looking. 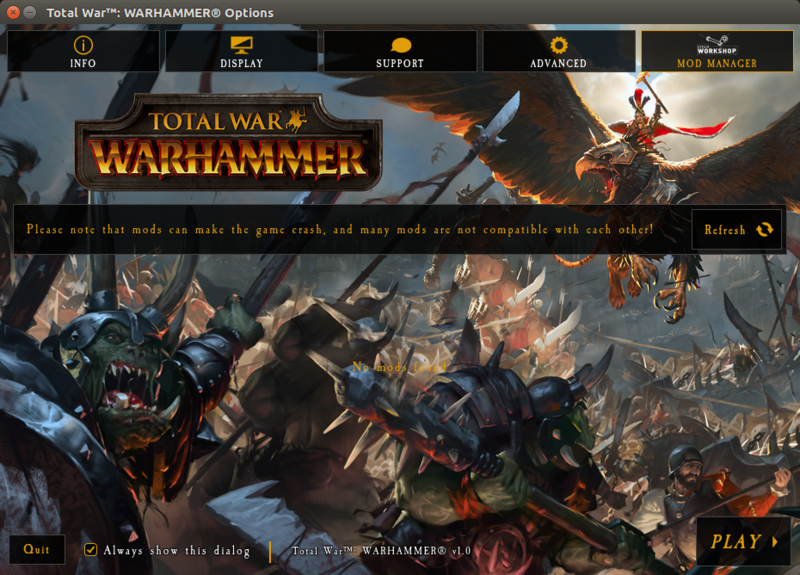 If you like Total War or Warhammer, this is probably a no-brainer purchase for you. If you’ve not played Total War before, this is probably a fantastic entry to get you into it as it’s quite easy to understand. You can find Total War: WARHAMMER on Steam and the Feral Store. Are you sure? I can get 60 fps with ATTILA (which uses the same engine I think) only with low settings. A German game magazine had reported that even with a GTX 980 the framerate drops to 20 fps at some situations (under Windows!). 60 fps would be a dream. I often not have this in the campaign card, if I use max. settings. And it stutters all the time even with 60 fps. "It is not cross-platform with Windows." And here we go again. I already know why, same reason as with the others. But seriously this is really frustrating. I'm sad that this will be another port I will not support. Quote What I like about the battle system is that you don’t actually have to command the battles yourself. You can have them auto-resolve and the AI will just do it and present the outcome to you. I've been burned by "auto-resolve" in so many games over the years that I refer to it as "auto-lose". In other games, I've had what should be have been a lopsided victory in my favor return a resounding defeat after clicking "auto-resolve". No thank you! It'd be great if it actually worked as expected in this game, but I have my doubts. Performance looks great, so thumbs up to Feral, although I may wait for a deep discount just so I can get the "complete" game. grenadecx "It is not cross-platform with Windows." And here we go again. What are the technical reason for no cross-platform multiplayer? It doesn't bother me in the slightest since I very rarely play multiplayer, but I'm curious. I would suggest Feral look into Enet. As far as networking libraries go especially for multi-platform support it's one of the best ones I know of. ENet provides a thin, simple and robust network communication layer on top of UDP. The primary feature it provides is optional reliable, in-order delivery of packets. ENet also omits higher level networking features such as authentication, lobbying, server discovery, encryption, & other similar tasks that are particularly application specific so that the library remains flexible, portable, and easily embeddable. "Any differences in the maths, even at the nth decimal place of precision, will accumulate to a tangible divergence in behaviour and ultimately a disconnect. When dealing with multiple architectures, operating systems and optimising compilers, tracking down all possible differences is a long and complex task." And here I always assumed math was math. I guess it must be differences of precision and how random values are generated.